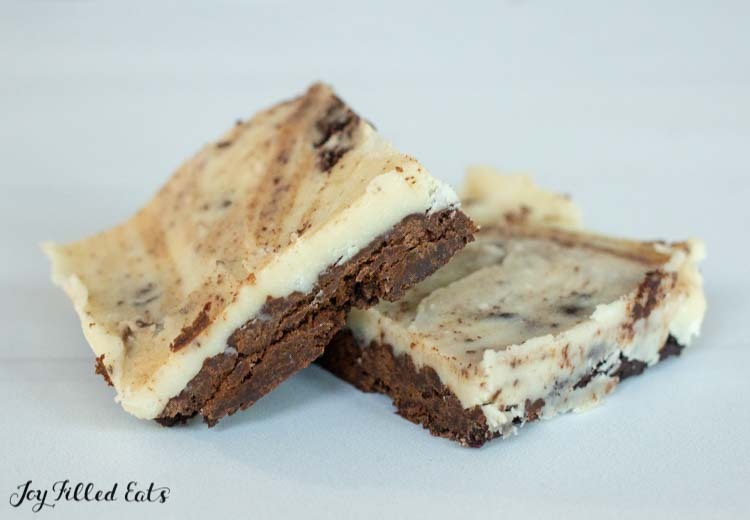 Peppermint Cookies and Cream Bars are a healthy cross between brownies, fudge, and peppermint Oreos. They are easy to make but rich and decadent and satisfy your chocolate peppermint craving more and more with every bite! Some of my favorite days are baking days. I hide in the kitchen and bake all day long. And taste test all day long. One of the biggest benefits of baking days is reusing dishes without washing them. There are just as many dirty dishes from one batch of brownies as there are from three batches of brownies. So why not make three batches of brownies? Right? As long as I keep the flavor profiles similar I can do from recipe to recipe without any major washing. Since both food blogging and having a larger than average sized family come with an awful lot of dishwashing needed I try to simplify whenever possible. As soon as December rolls around I look longingly at all the chocolate peppermint baked goods that deck out the grocery store. The rest of the year I prefer berries and lighter flavors like lemon and vanilla, but there is something about peppermint that reminds me of Christmas. Probably all the candy canes I sucked on as a child. Last year I make one of my favorite cakes, chocolate cake with peppermint buttercream and ganache, into Dark Chocolate Peppermint Cupcakes. And the year before I did a Peppermint Fudge Sandwich Cookies. 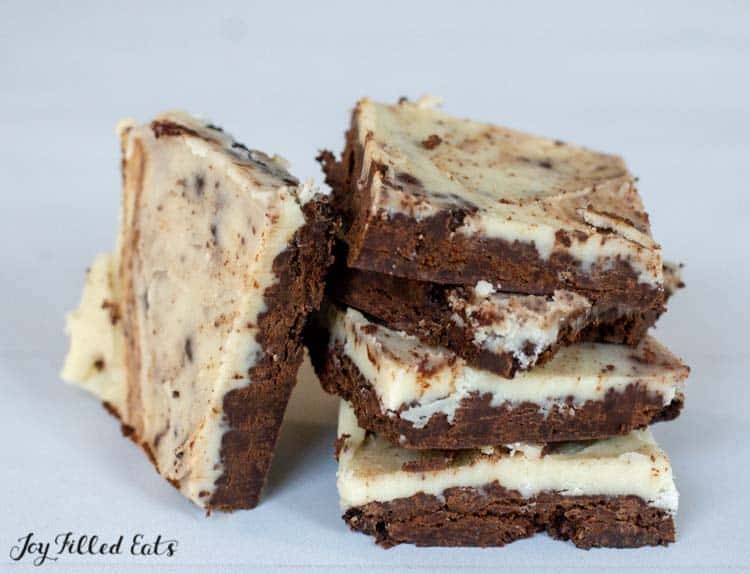 This year I wanted to do a peppermint brownie bar. I kept the brownie base thin so that that the peppermint buttercream icing really stands out. And it worked. 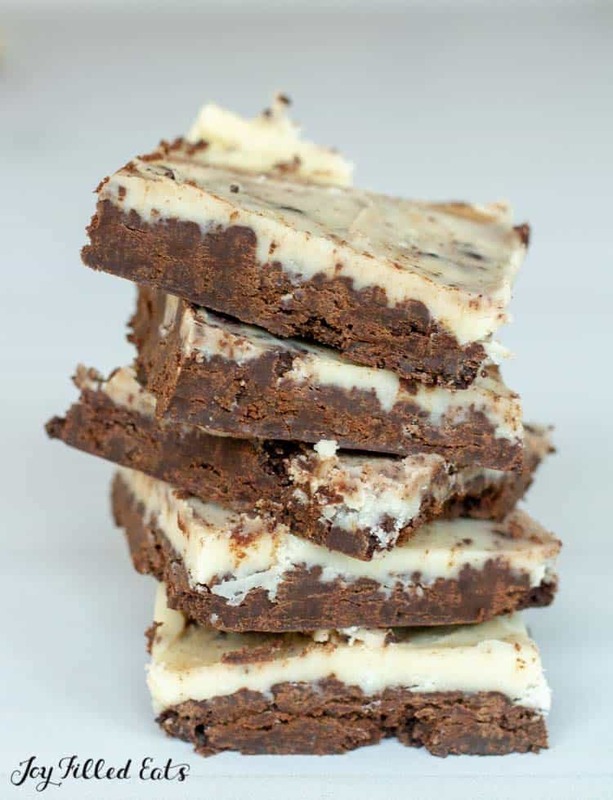 These Peppermint Cookies and Cream Bars have the perfect balance of chocolate and creamy mint! 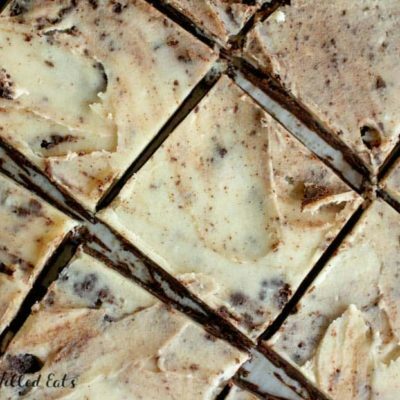 The cookie base for these bars is simply a melted chocolate brownie batter. You just melt some chocolate, butter, and sweetener. Stir in cocoa, eggs, and peppermint extract and you are done! I kept out the flours from this recipe and just used cocoa powder to deepen the chocolate flavor. 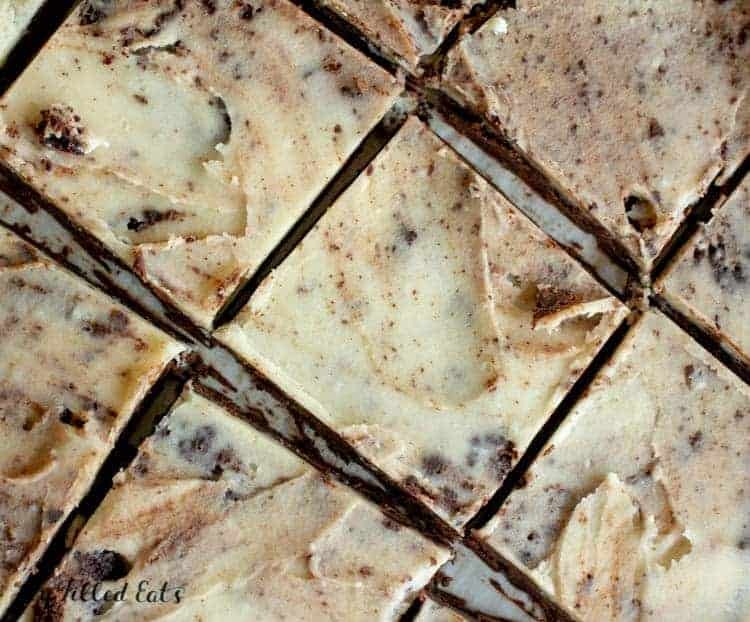 Lining the baking pan with parchment is necessary for easy removal of these cookies and cream bars. 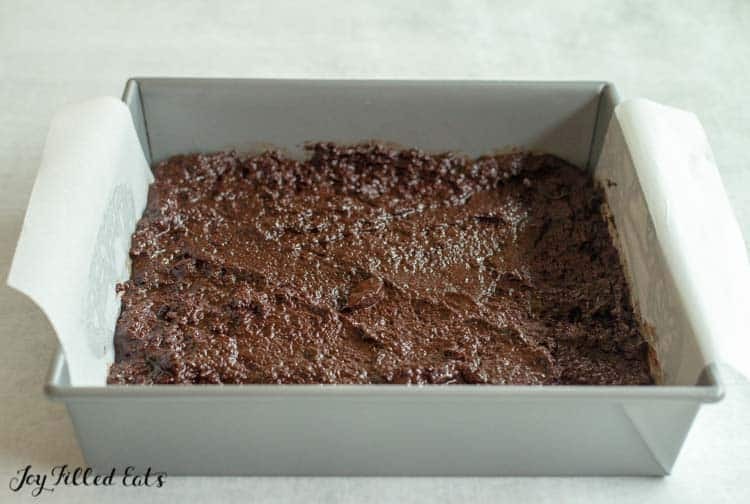 Once you bake and cool the brownie, mix up the icing and spread it on top. Don’t worry about some of the brownie crumbs getting mixed in. 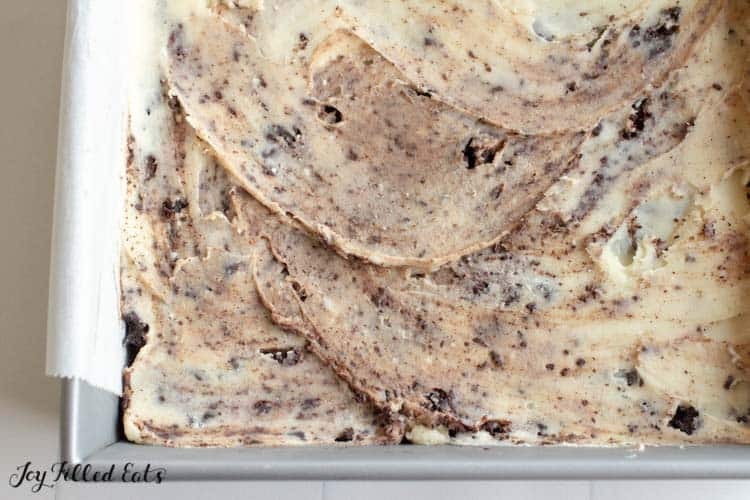 That is what gives the icing the beautiful swirled look just like cookies and cream ice cream. 85% Dark Chocolate – This dark of a chocolate bar is naturally low carb because it has such a high percentage of cocoa. There is only a little room left for other ingredients. If you would rather use an unsweetened chocolate you may want to increase the amount of sweetener in the topping to balance the bitterness. Sugar-Free Sweetener – I like to use a blend of xylitol, erythritol, and stevia in my recipes. You can purchase this pre-mixed from the Trim Healthy Mama website or mix your own according to my recipe. By using a combination of sugar alcohols and stevia you can use half the amount required of regular sugar. Since these sweeteners can be more expensive this helps with my food budget. I did take a shortcut and use powdered erythritol in the icing. This saves the step of grinding your sweetener of choice into a powder. I’ve found that for icings store-bought powdered sweetener is finer than I can achieve at home even though I have a high powered blender. Cocoa Powder or Cacao Powder – I’m currently using raw cacao powder which can be used for cocoa powder. Costco has Navitas Cacao Powder for a good price. I like the flavor in my baked goods. Peppermint Extract – You can find peppermint extract in most grocery stores. I like the one from Trader Joe’s but order whatever is cheapest from Amazon in a pinch. The rest of the ingredients in my Peppermint Cookies & Cream Bars are staples. Butter, Cream, and Eggs. That’s it! 1. Line your baking pan with parchment. It is much easier to lift this out as one big piece and then cut squares. 2. Cool the cookie bars completely before adding the icing. 3. Drop small blobs of the icing all over the bars and spread gently. You want some of the cookie creams to mix in for that classic cookies and cream look but obviously, you don’t want the bars to completely fall apart. 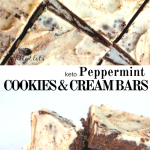 For the ultimate holiday peppermint treat enjoy these Peppermint Cookies & Cream Bars with my Crockpot Peppermint Hot Chocolate or Peppermint White Hot Chocolate! 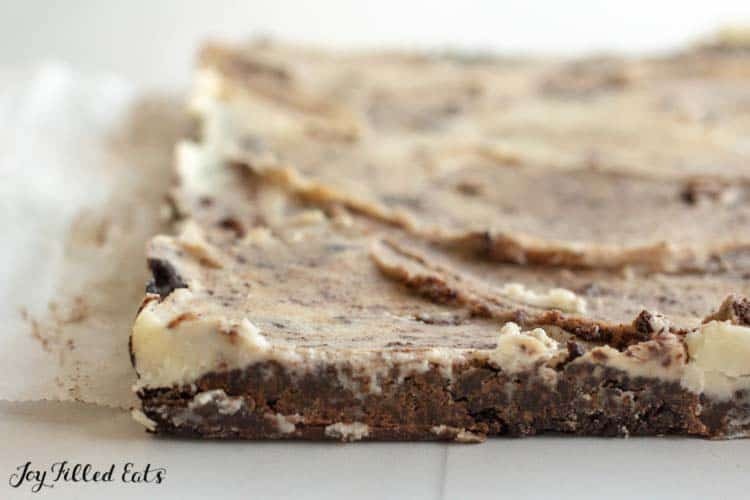 Peppermint Cookies and Cream Bars are a healthy low carb and keto cross between brownies, fudge, and peppermint Oreos. They are easy to make and satisfy your mint craving! Preheat the oven to 375. Spray an 8 x 8 baking dish with cooking spray and line with parchment paper. 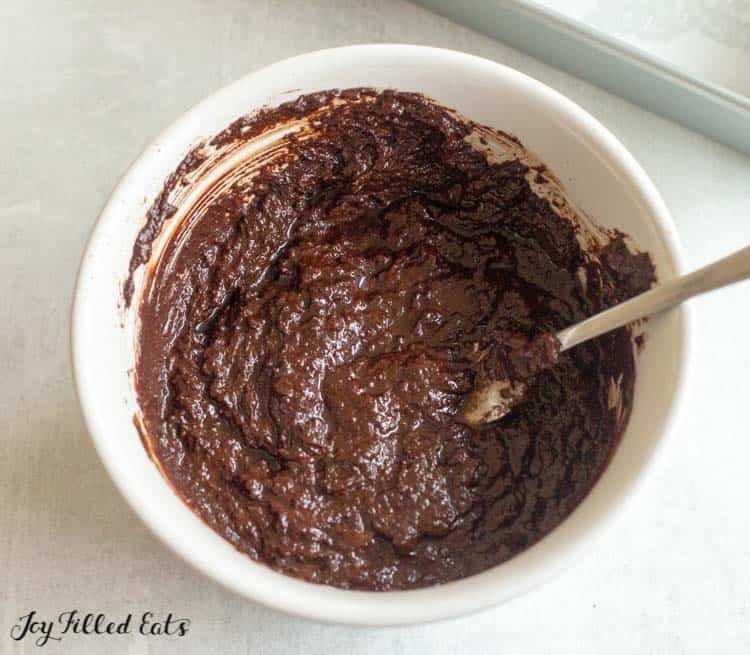 Melt the chocolate, sweetener, and butter in the microwave by microwaving at 30-second increments and stirring after each. When the chocolate is mostly melted stop heating the mixture and stir until smooth. (Alternatively. you can do this on the stovetop on very low heat). Whisk in the cocoa, eggs, and peppermint extract. Pour into the prepared pan. Bake for 12-14 minutes until firm to the touch. Do not worry if some of the butter pools on top, it will absorb back into the bars. Cool completely. Stir together the powdered erythritol, butter, cream, and peppermint extract until smooth. Drop spoonfuls on top of the bars. Spread gently. Some of the crumbs will mix into the icing giving it a cookies and cream look. Chill for at least 2-3 hours. Run a knife around the edges of the pan and then lift the parchment paper to remove the bars. Place on a cutting board and cut into 16 pieces. Enjoy! I made these and they were soooo good! The texture of the cookie part is so perfect for cookies and cream. Thank you for a great holiday treat! You read my mind! 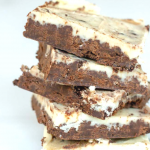 I was wanting to make something similar to those yummy, seasonal, frosted mint brownies that are so irresistible this time of year! Thank you! I can't wait to try these! 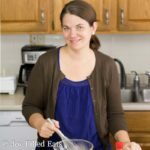 Any reason I couldn't use Gentle Sweet again in the topping instead of erythritol? You will need to grind it to a powder and use half the amount. If it doesn't make enough icing you could add some cream cheese. The powdered erythritol works more like regular powdered sugar which is why I prefer it in icings.